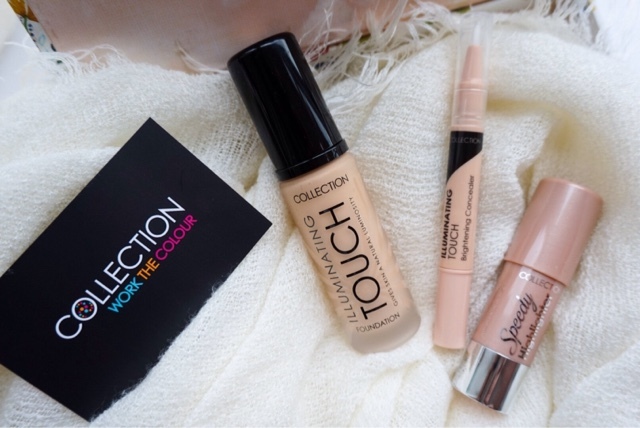 I'm quite new to Collection as a cosmetics brand, so when they contacted me about one of their recent releases focusing on glowing skin I was more than happy to accept and give the brand a try. I have to say considering what I knew from the brand in the past & the super affodable pricey they offer, I just didn't expect much from this trio; the Illuminating Touch Foundation* & Concealer* along with the Speedy Highlighter Stick* ... but I'll be the first to stand up and admit that I have been pleasantly surprised. 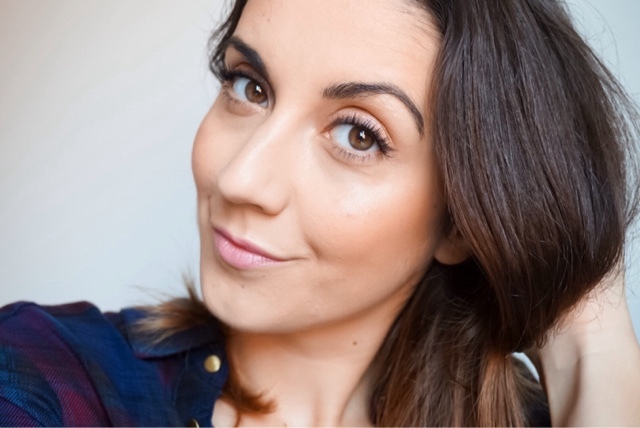 This illuminating range which promises a radiant complexion, has been my go to for a natural everyday makeup look with that glow from within. 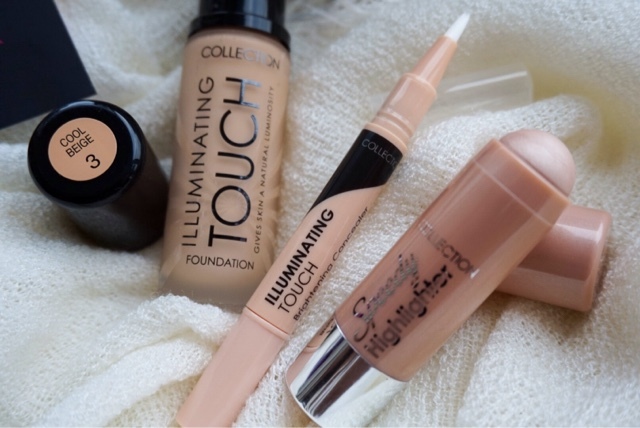 First up I'll talk about the Illuminating Touch Concealer (£4.99) as that's the first product I apply when I use all three from this range in my everyday makeup look. I have to say when I first clicked out some product I was taken back by how pinky/peach toned the shade was & I immediately tought to myself 'there is no way this will work on my skin tone'. However I decided to give it a go anyway and I was more than pleasantly surprised, as it covered my dark circles unbelievably well. It also blends out with my under eye area flawlessly, so you would never think it's a pink toned kind of concealer. I love the brush style applicator and just how simple it is to use. What I love most is that this doesn't crease like crazy under my eyes, it just sits really well on the skin. I don't think I could wear this on any other area of my face, but as an under eye concealer it just works for me & my dark circles. 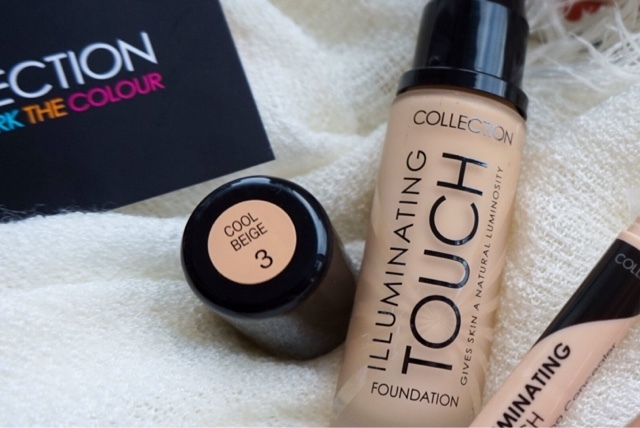 Then it's all about the Illuminating Touch Foundation (£5.99), which is probably my favourite product of the three. Considering the affordable price tag this is an amazing foundation. The coverage is medium & it has a dewy finish (my kind of foundation). However if you prefer a full coverage base or if you have oily skin, I don't think you would get on with this option as well. It takes a while to set on the skin, so a powder is pretty much necessary to avoid transferring or anything like that. I have dehydrate skin so I just use more of an illuminating powder and I use it with a light hand to make sure my skin doesn't feel tight or dry. Setting it lightly with powder also ensures that it lasts most of the day, which is another thing I was super happy with. I applied this on a regular day at work and when I saw how dewy the finish was I just didn't think it was going to last well throughout the day. But to my surprise I got home after a long 9 hour shift & couldn't believe how well my makeup had lasted. It wasn't perfect around some of the oilier areas of my face such as the nose, but it was still looking great. Last up I want to mention the Speedy Highlighter Stick (£3.99), which is your go to product for the latest #strobing trend. I love how effortless & easy it is to apply this product in all the areas that you want to highlight, then you simply blend it out using your fingertips for a natural healthy glow. There's no chunky glitters or shimmers wioth this product, just a gorgeous sheen of highlight. I've seen this kind of stick highlighter from other brand such as Clinique, Benefit & even No7 which I have tried myslef in the past (before Ellie decided to try & chew it up for breakfast... yup that's toddlers for you), but this is probably the most affodable option out there & it works just as well. Definitely one to check out if you're looking for a simple highlighter that will provide a healthy glow. I can't recommend Collection as a brand enough after trying out this new range, because I am pretty much blown away by the quality considering how affordable everything is. The only thing worth noting is that the shade selection with the foundation is not great (offering 6 shades & I'm personally shade 3), sadly this is the case with most budget brands. Other than this issue, I have been loving the trio & would definitely recommend them if you have normal to dry skin or if you're looking for a dew/radiant kind of finish. I've also noticed that they are bringing out some amazing releases at the moment & in the future, so they are definitely a brand that have upped their game & worth looking out for. I'd love to hear your thoughts on this range... have you tired it? Or do you have any other recommendations from the brand for me?